Interested in the Short North? You may also want to check the Italian Village and Victorian Village pages. Italian Village/Short North Area - 37 East Russell Street, Unit B - Available Now - Great location just steps from High Street and The Cap but on a quiet residential block. 2nd floor 2 bedroom, 1 bath flat featuring exposed brick and a combination of hardwood floors and carpet. Completely updated with newer windows, heat pump with central air conditioning. Kitchen with all appliances including dishwasher and new granite counters. Large bathroom has good storage and new vanity and cabinet. Both bedrooms with good closet space. Washer & dryer in the apartment. One car garage space included and optional security system. Ideal home for a couple or an individual wanting extra space. Rent $1445/month, resident responsible for electric and water & sewer. No pets please. To schedule a tour, please call (614) 444-2100 or use the contact link below. To see our other available units please visit Cheplowitz & Associates. Short North - 956 N. High Street - Available April 28th - 1 bedroom, 1 bath has a wonderfully open floorplan with exposed brick and a decorative fireplace. Kitchen features concrete countertops, dishwasher, garbage disposal, microwave, and oven. Washer/dryer are included for your convenience. The building is a secure 8 unit building with an intercom at the street level. Reserved assigned parking included. This great loft is $1,350 with an additional security deposit. No cats. Quiet dogs are negotiable for an additional fee. To arrange a tour of this great loft apartment, please call at (330) 502-7561 or use the contact link below. Sorry, there currently are no efficiencies available in this area. Please check back for future listings. Have a property in this area you'd like to advertise? Contact us here. Short North Area/OSU Area - 74 E 7th Avenue - Cookie's Place - Available early August - Only $900 for this 1,002 square foot, 1st floor, 1 bedroom, 1 bath apartment in excellent condition. Classic unpainted woodwork, hardwood floors and two working pocket doors separating the two large rooms. Separate kitchen features French door refrigerator with chilled water and ice maker. Low utilities with the high-efficiency gas furnace and central A/C, shared free use of 1st floor washer/dryer and pet friendly (with additional refundable security deposit) enclosed back yard sanctuary. Garage with automatic opener. Landlord pays water/sewer. Available Now. Rent is $900/month, contact the owner, Andy at (614) 299-6139 or use the contact link below. Short North/Victorian Village - 11 W. 1st Avenue, Unit D - Available end of July - The Quinn Condominium is in the epicenter of the Short North action. No walk to where things are happening. Come join this laid back, friendly community of owners and renters. Connected, relaxed, professional vibe. Attractive unit in classic brick building with six second floor residential units. Phone intercom/buzz-in system. One bedroom, one bath unit with 9'-ceilings, sharply appointed kitchen and custom inlaid sink, beautiful cabinetry, granite counter top and back splash. Features a separate bedroom with Great Room and I-Kitchen. Unique Feature is the elevated terrace: Key to the living experience is the convenience of a three step walk to the elevated, private two-tiered terrace (15 ft. x 54 ft.) with gas grill for use of just the 6 residential units. Unmatched terrace in the Short North! If you enjoy being outside in your own private area shared by just a handful of others, this is it. Rent is $1,295/month. Permit parking and a guest pass available through the city of Columbus for $25. Lease Terms:-12 to 24 month lease (flexible). Owner pays for water bill and trash. Deposit: one-month. Application fees totals: zero (privately owned). Common area gas grill provided. Small dogs or cats okay (no additional deposit). No hidden "Management" or "Community" fees which can be both unspecified and expensive/significant in new development leases. Dog and cat Friendly. Low utilities: thick brick walls and new, double-paned windows equal much lower utility bills. For more information call (614) 649-3138 or use the contact link below. Short North - 956 N. High Street - Available April 28th - This is a 1 bedroom, 1 bath condo in the Short North just steps away from restaurants and attractions. Your new home has a wonderfully open floorplan with the living room, kitchen and dining room in one large space. The living room section has one wall that is all natural brick with a decorative fireplace for great character. The kitchen is equipped with concrete countertops, dishwasher, garbage disposal, microwave, and oven. The brick carries over to create two beautiful walls in the bedroom. The home is cooled with central air and warmed with natural gas. Washer and dryer are included for your convenience. Your building is an exclusive building with only 8 units total lending to a quiet living environment. The building is a secure building with an intercom at the street level door and guests can be buzzed in. Parking is provided with one assigned space in the rear of the building. 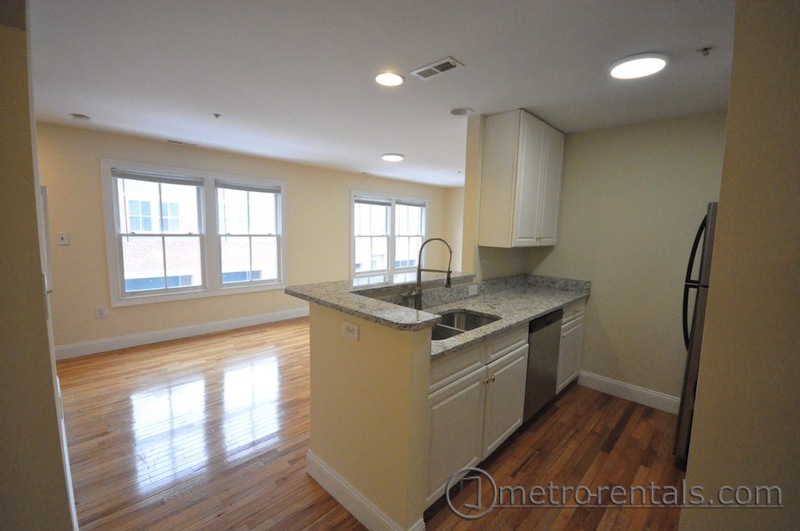 This great loft is $1,350 with an additional security deposit. No cats. Quiet dogs are negotiable for an additional fee. To arrange a tour of this great loft apartment, please call at (330) 502-7561 or use the contact link below. Short North - 30 W. 5th Avenue, Apt. 2C - Available June - This remodeled loft-style apartment is urban living at its best. Large open floor plan includes exposed brick walls, white-washed hardwood floors that run throughout. Track lighting and ceiling fans connected to an exposed beamed ceiling. All appliances including washer/dryer. One enclosed parking garage space included. Access to a shared, gated and elevated deck. Gas heat, Central A/C. Cable ready. 24 hour maintenance. Rent: $1185/month. Pet policy: one-time non-refundable fee of $300 and $30 monthly pet rent. Tenant is responsible for electric, gas and water. To schedule a tour, please call Day Companies at (614) 450-1760 or use the contact link below. To see our other available units, please visit Day Companies. Italian Village/Short North Area – 25 E. 5th Ave. - Available Now - This is a 1 bedroom, 1 bath flat located near the corner of 5th and High streets steps from the shops, restaurants and pubs of the Short North. Recently renovated with new hardwood floors, amazing wood work and decorative fireplace. The kitchen is designed with stainless steel appliances and granite countertops. The open floorplan allows for flexibility to fit your needs. The bedroom is very nicely sized with hardwood floors, large windows, and reach in closet. Enjoy the outdoors on the brand new balcony. On-site parking is available. This unit does not allow pets. Rent is $1450/month. To schedule a tour, please call Day Companies at (614) 450-1760 or use the contact link below. To see our other available units, please visit Day Companies. Short North - 1195 Mt. Pleasant Ave. - Available July 15th - Renovated two bedroom upstairs apartment located in Short North. Large living area with fireplace façade. New kitchen including all major appliances. Enjoy the convenience of a washer and dryer in the unit. Large balcony. Hardwood floors and ceilings fans throughout. Central A/C and gas heat. Sqft: 960 Rent: $1375/month. Tenant is responsible for their own utilities. For more information, please contact Day Companies at (614) 450-1760 or use the contact link below. To see our other available units, please visit Day Companies. Italian Village/Short North Area - New Village Place - The Astor - Available Now - Pet Friendly - Two bedroom townhouse located just 2 blocks east of the Short North. Vinyl plank flooring throughout the first floor and carpeting upstairs. Spacious kitchen with adjacent breakfast nook, granite counter-tops and stainless steel appliances including dishwasher and a built-in microwave. Additional features: LED lighting, central air conditioning, gas heat, washer/dryer hook-ups. New Village is a 100% smoke-free community. On-site management and 24 hour maintenance. Some off-street parking available, neighborhood will transition to permit parking early 2019. Several on-site green spaces with pet waste disposal stations. Rent is $1500/month. To schedule a tour and for more information please call (614) 291-9121 or use the contact link below. To see our other available properties, please visit New Village Place. Italian Village/Short North Area - New Village Place - The Broadway - Available Now - Pet Friendly - 2 bedroom, 1½ bathroom home located just 2 blocks east of the Short North. Vinyl plank flooring throughout the first floor and carpeting upstairs. Spacious kitchen with adjacent breakfast nook, granite counter-tops and stainless steel appliances including dishwasher and a built-in microwave. New Village is a 100% smoke-free community. On-site management and 24 hour maintenance. Some off-street parking available, neighborhood will transition to permit parking early 2019. Several on-site green spaces with pet waste disposal stations. Rent for this home is $1600/month with an additional security deposit To schedule a tour and for more information please call (614) 291-9121 or use the contact link below. To see our other available properties, please visit New Village Place. Sorry, there currently are no three bedroom units available in this area. Please check back for future listings. Have a property in this area you'd like to advertise? Contact us here. Sorry, there currently are no four+ bedroom units available in this area. Please check back for future listings. Have a property in this area you'd like to advertise? Contact us here.